Kindly check dates and rates for availability & offers. Arrival in Tallinn, transfer to Hotel Radisson Blu Olympia**** or similar, check-in, welcome meeting. After breakfast we drive to the Lahemaa National Park, where we visit the Manor Houses in Palmse and Vihula. We continue to Tartu, the university town, where Estonia gained its statehood. We see the charming Old Town and the University founded in 1632. From Tartu we drive onwards into Latvia and Cesis, a Hanseatic city with winding streets, castle ruins and beautiful gardens. Check-in at Hotel Kolonna Cesis*** or similar. ToDAY - we drive through the Gauja National Park to Sigulda, a popular holiDAY - resort. We see the ruins of the Episcopal Castle and the ruins of the Castle of the Knights of the Sword before we drive around Riga to hit the highway down to Vilnius. En route we reach the magnificent Rundale Palace, the former summer residence of the Duke of Courland. Following a guided tour of the palace we travel through Lithuania to reach Vilnius late afternoon. Check in at Hotel Radisson Blu Lietuva**** or similar. Vilnius is known for its more than 1.200 medieval buildings and 48 churches. 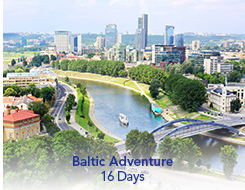 The morning sightseeing tour includes a panoramic tour of the city and a walking tour of the Old Town with Vilnius Cathedral, Gediminas Tower, Peter and Paul Church, St. Anna's Church, Old University and the Gates of Dawn. After the tour we continue to Trakai, the medieval capital of Lithuania and we visit the well preserved Trakai Castle, beautifully located on an island in Lake Galve. The balance of the DAY - is spent en route to Klaipeda, where we arrive late afternoon. Check-in at Hotel National**** or similar. ToDAY - we continue to the Curonian Spit, a thin, 100 km stretch of land between the Baltic Sea and the Curonian Lagoon with small fishing villages, pine forests and endless sand dunes. The first stop is at the Hill of Witches in Juodkrante. After that we continue to Nida where we visit the High Dunes, Thomas Mann's Summer House and get acquainted with the charming resort town. Check-in at Hotel Nidos Banga***. With its location at the Curonian Lagoon and its combination of old-fashioned fishing village and fashionable sea resort Nida is one of the most attractive places on the entire Baltic Sea Coast You will be spending a whole week on your own in this small paradise and there is enough to do: biking on the spit, hiking in the dunes, boating in the lagoon, swimming in the sea, sun bathing on the sandy beach, playing tennis in the sun, lunching on smoked fish, attending the many summer concerts and enjoying life in full scale. The last DAY - in paradise. You still have the whole DAY - to enjoy Nida, take a last swim in the Baltic Sea, make the last stroll through the fishermen's village, enjoy a last breathtaking view of the Curonian Lagoon, do you last bargains in the amber and souvenir stalls in the pedestrian centre of the resort and shoot your last holiDAY - photos from the Curonian Spit. Late in the afternoon we board the coach which brings us up the spit and back to Klaipeda. Check-in at Hotel National**** or similar. The evening offers an optional Lithuanian dinner at Restaurant 19th Century. Klaipeda first became a part of Lithuania in 1923 and had a long history as a German town called Memel. A short sightseeing tour takes us to the Old Town with its narrow, cobblestone streets and old guild houses and we visit the Theatre Square and the Aennchen von Tharau Fountain. We now continue to the Samogitia National Park, where we enjoy a walking tour around the picturesque Lake Plateliai (2 hours, medium). After that we continue to Siauliai and Cross Hills, one of the holiest sites of Catholic Lithuania. We head North into Latvia and reach Riga in the afternoon. Check-in at Hotel Radisson Blu Latvija**** or similar. The evening offers an optional organ concert at the Dome Cathedral. Founded in 1201 by the German bishop Albert, Riga is the largest of the three Baltic capitals and boasts a true kaleidoscope of various architectural styles. The walking tour of the Old Town includes Riga Castle, Dome Cathedral, St. Peter’s Church, Swedish Gates, Three Brothers, Large and Small Guild House and the Freedom Monument. The afternoon is reserved for an optional visit to Jurmala, the vibrant Latvian sea resort, famous for its wooden architecture and sandy beaches. In the evening enjoy an optional Latvian dinner at the stylish Restaurant Forest. The tour continues along the coastal highway to the Estonian summer resort of Parnu. We do a short tour of the resort before we continue through the North Estonian land of forests and arrive in Tallinn early afternoon, check-in at the Hotel Radisson Blu Olympia**** or similar. Tallinn is a charming blend of medieval tranquillity and modern urban life. The medieval Old Town is a busy place in the summer with its many shops, galleries, souvenir markets, outdoor cafés and restaurants. The afternoon sightseeing tour takes us around the old medieval city walls and into the Old Town where we see Toompea Castle, Dome Church, Alexander Nevsky Cathedral and medieval Old Town Hall. Entrances to Palmse Manor House, Rundale Palace, Old University in Vilnius and Thomas Mann’s Summerhouse in Nida.